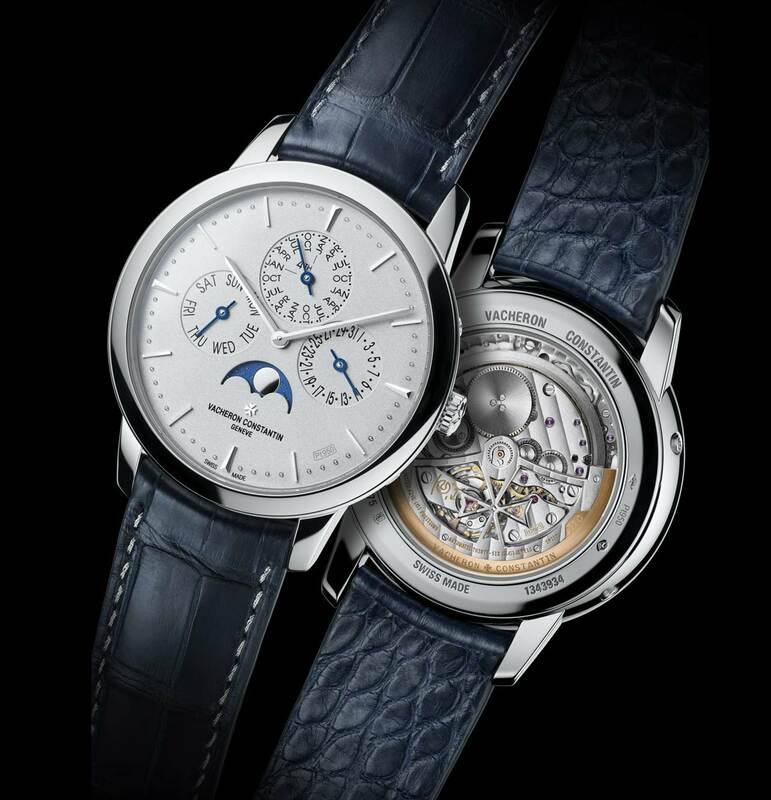 exceptional timepieces, all made in platinum and issued in limited series. Platinum's density and weight make it extremely resistant and durable compared to the other metals used for jewels and watches. For these qualities, this exclusive metal is a favourite among collectors. 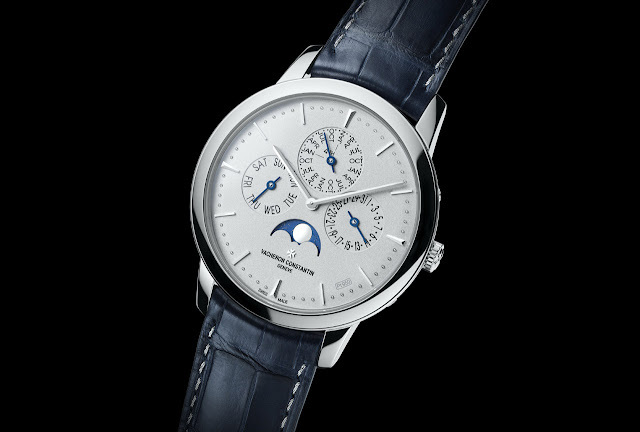 This collection is now enriched by a 950 platinum version of the Patrimony Perpetual Calendar that will be produced in a 100-piece limited edition. The 41 mm x 8.96 mm case is water-resistant to 3 bar (approximately 30 metres) and fitted with a sapphire back enabling one to admire the ultra-thin Calibre 1120 QP, a mechanical self-winding movement driving the hours and minutes hands, the moon phases at 6 o’clock along with a perpetual calendar displaying the day of the week at 9 o’clock, the date in a counter at 3 o’clock, the month and leap year at 12 o’clock. 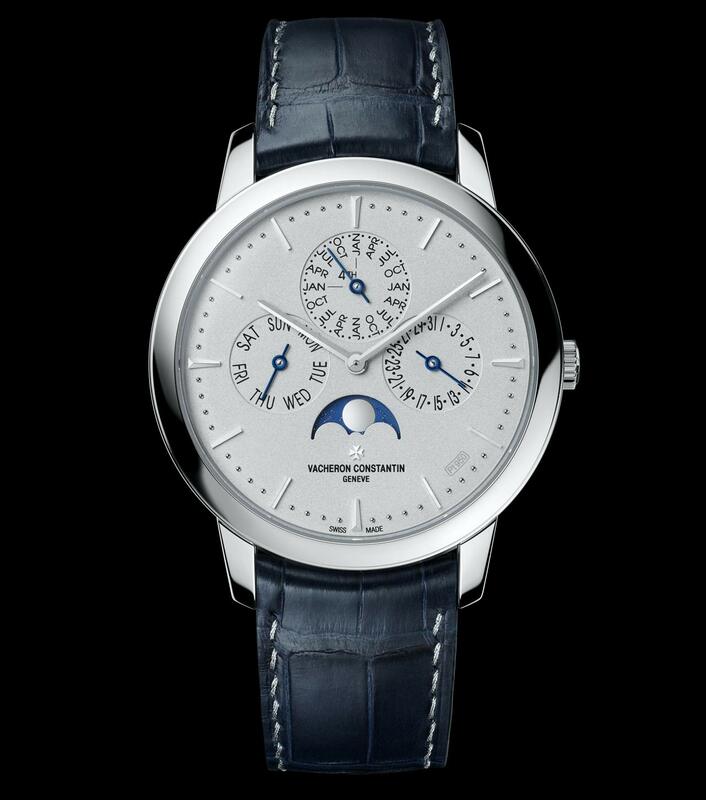 Beating at the frequency of 2.75 Hz (19,800 vibrations per hour), it offers a 40-hour power reserve. This highly complicated calendar will not require any corrections until March 1st 2100 taking account of the leap-year cycle with its 31-, 30- and 28-day months, as well as the quadrennial recurrence of February 29th. Not only complicated, the Calibre 1120 QP is also ultra-thin with a thickness of just 4.05 mm. The oscillating weight is cut out in the shape of a Maltese cross, the symbol of the Maison. 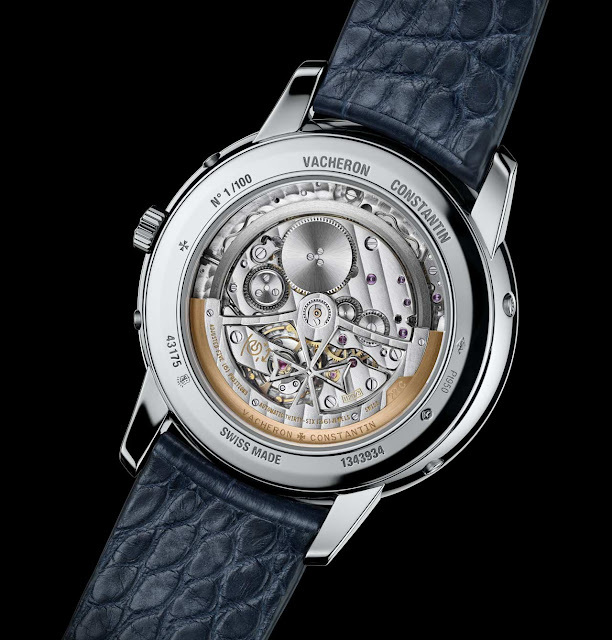 The dial is also crafted from platinum as confirmed by the inscription "Pt50" between 4 and 5 o’clock. The finely grained sand-blasted dial is slightly convex and adorned with a circular "pearl" minute-track and white gold applied hour-markers. 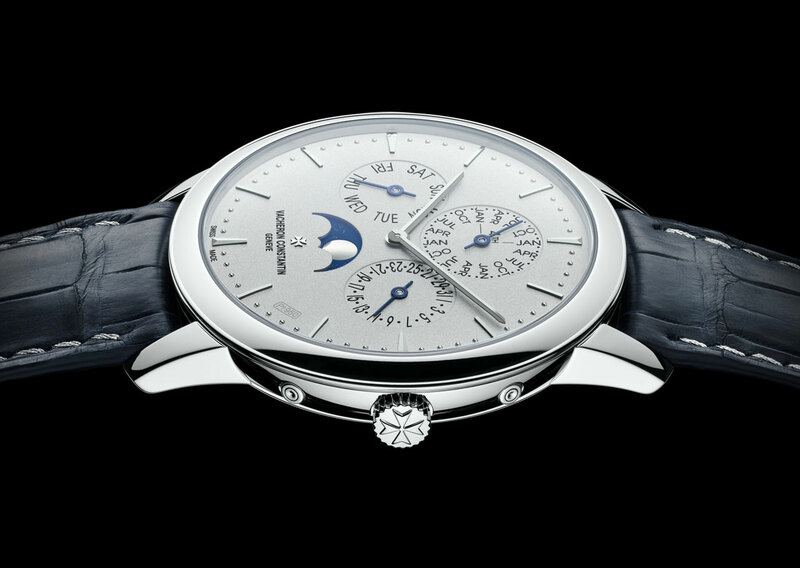 The hours and minutes hands are in white gold, while the calendar pointers are in blued steel. stunning, any idea of the price? Vacheron Constantin - Patrimony Perpetual Calendar Collection Excellence Platine. Vacheron Constantin's Collection Excellence Platine was started in 2006 and includes exceptional timepieces, all made in platinum and issued in limited series. This collection is now enriched by a 950 platinum version of the Patrimony Perpetual Calendar that will be produced in a 100-piece limited edition. 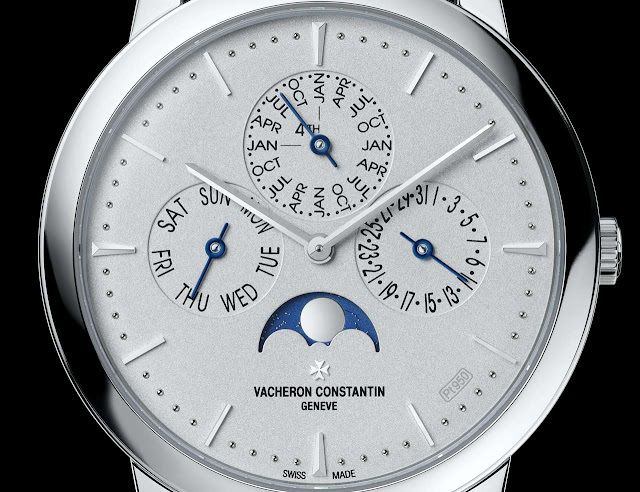 The Vacheron Constantin Patrimony Perpetual Calendar Collection Excellence Platine (ref. 43175/000P-B190) bears the Hallmark of Geneva to certify the standard of excellence.